Assurance of service quality and reliability is paramount as service providers compete in an open telecommunications marketplace. Between many of the service control points and switching centers stand thousands of utility poles upon which are installed myriad's of hardware items that support the wireline network system. In April of 1994, GTE Telephone Operations began a three-year study of stainless steel hardware in Hawaii (Laie Point, Oahu). The purpose of the study was to determine the feasibility of substituting stainless steel hardware for galvanized hardware. GTE's Hawaii Regional Operations has experienced severe corrosion of outside plant (OSP) hardware for many years along many points of the island's shoreline. In some instances, corrosion-induced failures of such hardware can lead to downed poles or cables. Further, the onset of corrosion leads to a development of unsightly surfaces which can suggest poor part quality to the general public. GTE schedules crews for replacement of such hardware on a continual basis. The cost of replacing hardware is a combination of material (relatively inexpensive) and labor (expensive). As service providers strive to find ways to reduce costs while maintaining physical plant, ways to improve reliability of the OSP are of paramount importance. For the vast majority of telecommunications services users, provision of quality service depends on the stability of the aerial plant (supporting copper and fiber for voice and date communications, and coaxial cable for video). After beginning the study, the fact that two problems required solutions became obvious to GTE, both in Hawaii and at GTE Telephone Operations in Irving, Texas. First, identifying alternative materials to replace the galvanized steel in the highest exposure areas was critical; second, GTE must partner with the vendors of galvanized products to jointly find ways for improving their products. In order to make an informed decision earlier than that involved in the three-year outdoor trial, GTE Laboratories in Waltham, Massachusetts, was asked to get involved, and initiated an accelerated testing study. A simulated Hawaiian atmosphere was generated within an environmental chamber which permitted cycling both temperature and humidity while alternating between the generation of an acidic salt fog and high humidity conditions. The following are the results of GTE Laboratories' work. An acceleration factor between 10 and 12 was determined based upon standard sample studies under conditions typical for Hawaii. That is, three months of accelerated testing roughly simulated three years of outdoor exposure. Tests then allowed for comparing galvanized pole line parts to similar parts manufactured from stainless steel. Galvanized (zinc coated) steel has served as the material of choice for pole line hardware for many years and has generally provided long-term, trouble-free service. However, when such materials are deployed near coastal or heavily industrial areas, their service lifetimes are severely shortened. In tropical coastal regions, the confluence of temperature, humidity, and high levels of exposure to salt-laden air increased the rate of corrosion damage to galvanized parts. After just one year of deployment, parts can show severe weathering damage (see Figure 1 below). The galvanized coating is a "sacrificial" layer which protects the underlying surface both physically and electromechanically. Thus, the coating's protective capability is finite. Nonetheless, many cases of earlier-than-expected initiation of corrosion were obvious. These occurrences suggested that the vendors were not monitoring the quality of their parts as carefully as necessary. 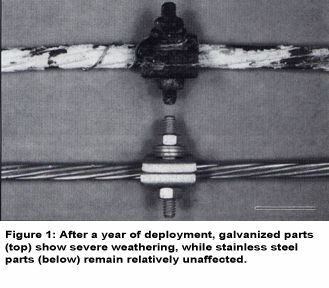 Early results showed that the galvanized parts exhibited significant corrosion within only DAYS of exposure. Determining whether the longterm corrosion resistance of the stainless steel would provide a large enough benefit to offset the higher initial cost was critical. The stainless steel hardware showed excellent corrosion resistance both in the first 18 months of the field trail and after the accelerated testing. Early instances of discoloration and slight corrosion damage were traced back to inconsistent manu- facturing procedures. Correction of these procedures led to material with no observable corrosion damage in any of the accelerated tests. Slight discoloration was still found on several of the stainless steel parts, but this is only a surface effect and not indicative of incipient product corrosion. Armed with data from the accelerated testing experiments and the results from the field study, GTE Telephone Operations organized a meeting attended by GTE staff from the relevant supporting organizations and each of the pole line hardware vendors. Performance of each vendor's part was reviewed. Discussions focused upon ways of imroving the quality and uniformity of the galvanization coating to provide optimum corrosion protection. The crucial roles of proper surface treatment as well as careful control of the manufacturing process were highlighted in discussions with the stainless steel vendor. The combination of early results from the field trail and data from the accelerated testing allowed Telephone Operation's staff to assess the current status of the galvanized hardware. A thorough review of manufacturing and materials quality, process control, and quality assurance sensitized and educated the vendors about GTE's expectations. As a result of this work, GTE constructed a business case for replacing galvanized products with stainless steel hardware in deployment scenarios where the pole line hardware will be exposed to harsh environments. The results of the business case indicated that the higher initial cost of stainless steel will be offset in less than seven years of deployment. A plot of the initial dollar investment for deployment of the stainless steel products in several Hawaiian locations. 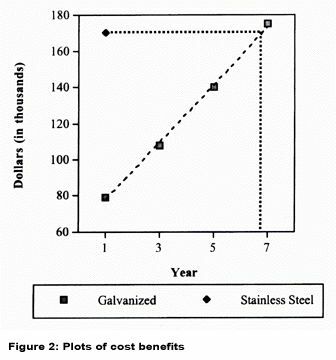 ; the equivalent initial cost had the hardware been galvanized; the estimated replacement cost for galvanized product over the ensuing seven years; and the point where the cost of the stainless steel hardware would be offset are shown in Figure 2 below. More importantly, the business case reflected that the expected lifetime of these parts will provide a financial savings to the service provider for many years to come in reduced replacement and reinstallation costs and a decrease in the number of corrosion induced hardware failures. GTE stands to realize a long term financial "ripple effect" in resource recovery since the local staff responsible for overseeing and implementing the continual replacement of galvanized hardware will be freed for other tasks. Finally, GTE will also benefit by receiving higher quality galvanized parts as the vendors respond to upgraded requirements for improved process control and quality. Over fifty projects are already in the planning stages for deployment within Hawaii alone. Other potential areas for deployment include the Dominican Republic (Codetel), along the Houston, Texas ship channel, and other mainland coastal regions.